The white granite pillars are an impressive sight to see when you walk up to the entranceway of the Alberta Temple in Cardston, Alberta. The architecture of the Alberta Temple in Cardston, Southern Alberta is some of the finest of any of the churches throughout Alberta. The enormous white granite pillars are just the beginning to what lays ahead inside and on the grounds of the Church of Jesus Christ Latter Day Saints in Alberta, Canada. Pillars at the entrance to the Alberta Temple, Church of Jesus Christ Latter Day Saints, in Cardston, Southern Alberta, Alberta, Canada. 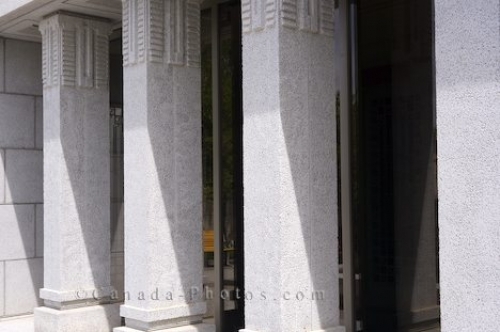 Picture of the massive pillars outside the entranceway to the Alberta Temple in Cardston, Southern Alberta.